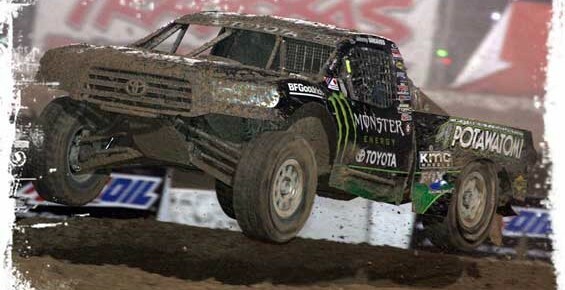 Greaves & McGrath RUN WILD at Las Vegas Motor Speedway in 2009 TORC Series Finale! Las Vegas, NV (October 29, 2009)–The familiar Monster Energy black and green colors entertained the crowds at the Las Vegas Motor Speedway on both Friday and Saturday nights as America’s favorite off road racer, Johnny Greaves and Super Cross Legend, Jeremy McGrath, put on a performance that fans will not soon forget. Both racers ran wild in hopes of earning victories in the last race of the 2009 TORC Series season. 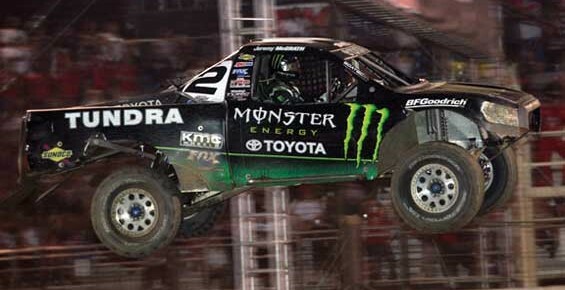 Driving the #2 two-wheel drive machine to the podium in Round 15 of the 2009 TORC Series was Super cross Legend Jeremy McGrath. The final race weekend of the season kicked off in front of an enthusiastic Las Vegas Motor Speedway crowd held on the world-famous Speedway Dirt Track. McGrath was all business as he conversed briefly with crew chief and spotter, Curt Greaves, over the race radio preparing for the 16-lap PRO 2WD Round 15. With an inverted start that put McGrath in the second row on the starting line, the #2 Monster Energy/ Toyota/ Potawatomi/ BFGoodrich backed race truck shot off the start line like a speeding bullet. McGrath pushed the #2 PRO 2WD race truck to the edge, jumping out to an early lead and battled among the top five throughout the race. 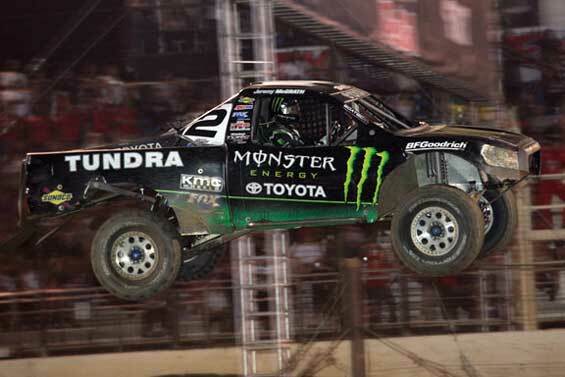 McGrath’s Toyota TRD motor package delivered impressive power to the 35″ BFGoodrich Tires that churned up the Vegas Dirt Track racecourse. Over the course of Friday night’s race, TORC officials restarted the race four different times and McGrath had plenty of go-power to roar to the front. Jeremy charged hard for what would be an incredible first victory, while racing door-to-door with those racers vying for the season championship. After a long red flag at lap 11, McGrath started right where he left off and charged towards the front, as Ricky Johnson and Rob MacCachren criss-crossed for the top spot. As the white flag waved, McGrath put an exclamation point on the night and finished in third position behind the two championship drivers. Johnny Greaves pulled the #22 Monster Energy/ Toyota/ Potawatomi/ BFGoodrich Pro 4WD onto the racetrack as fans cheered on the Wisconsin-based off road racing champion. It was clearly apparent from the earlier practice sessions that the Monster Energy race truck was ready to for some serious race business. The spectators rose to their feet as the field of TORC Pro 4WD trucks roared to life and they all charged into the wild first turn. Johnny Greaves immediately began working his magic, dicing his way through the field, but that all slowed down when he was railed into the outside wall by Amsoil’s #7, Scott Douglas. Greaves may have lost some steam after heavy contact with the outside concrete wall, but he gathered himself and charged the #22 Monster Energy/Toyota/Potawatomi/BFGoodrich Pro 4WD back into the field. Heading into the high-speed final turn on the track, Greaves carved out a turn along the high side of the banked left-hander and about that time, Scott Douglas moved up the track in front of him. Greaves and Douglas collided once again, but the #22 Monster Energy/Toyota/Potawatomi/BFGoodrich Pro 4WD continued charging. After a wild 16-laps of racing, Greaves earned a solid fourth place finish. The TORC Pro2WD gladiators came onto the racetrack for the final race of the season, kicking off the last night of racing for the 2009 TORC Series. The Las Vegas fans packed into the Vegas Dirt Track grandstands and stood on their feet in anticipation of the PRO2WD finale. 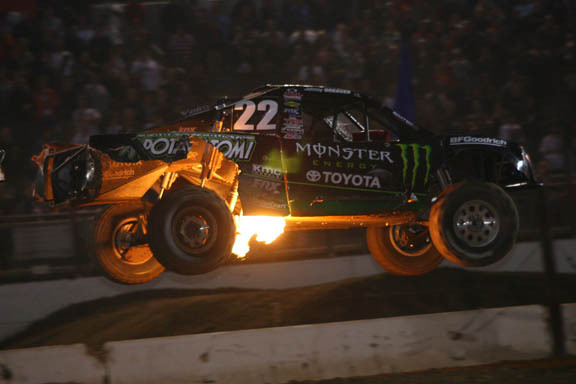 Johnny Greaves Motorsports racer, Jeremy McGrath, wheeled the #2 Monster Energy/Toyota/Potawatomi/BFGoodrich Pro 2WD onto the track and the crowds went wild. As the green flagged dropped, McGrath took the hole shot and jetted to the front, but coming into the second turn, the truck pitched slightly sideways and half of the field got by. It was a chore to make up track position on the difficult .5-mile racetrack at the Vegas stadium, but the Super Cross Legend never gave up. By the mandatory mid-race caution, McGrath had made up positions and at the green flag, he began his final charge … but it was not meant to be. The laps counted down as several yellow flags slowed the race action. In the end, McGrath finished 8th in the spectacular Pro2WD race. Johnny pushed the #22 hard through the corners and the truck performed phenomenal. “We nailed the setup for the track. The suspension was dialed, we had the right groove and the BFGs were really hooking up. Toyota TRD really gave us an aggressive package that made great power,” said the Wisconsin-native. “I’m disappointed because we really had the right stuff here tonight, but one mishap and it all went away. Finishing the season in fourth overall in the season point’s championship is mediocre in my books and I promise that we are headed to the 2010 season with a vengeance to win another PRO 4WD Championship,” said the dejected racer. Both McGrath and Greaves finished up the season championship point’s race in fourth position overall among their respective classes. With the 2009 season wrapped up, Johnny Greaves Motorsports is already looking at the 2010 TORC Series season. “We’re going to make some changes on both of the trucks for the better and we are going to continue our extensive testing throughout the winter working out of our Temecula, California shop. We’ll be back faster and stronger for next season,” commented the grinning Johnny Greaves. Tune into ABC Sports on Sunday, November 8 at 1:30 p.m. EST / 10:30 a.m. PST and watch all the race action from final two rounds of the 2009 TORC Series. Check your local listings for broadcast times on ABC Sports in your region. Perris, CA (September 28, 2009)-Monster Energy backed Johnny Greaves Motorsports arrived to Southern California in the middle of a blistering heat wave for the 2009 TORC Traxxas Series Rounds 13-14 held at the Perris Auto Speedway. Over 12,000 fans filled the dirt track stadium to watch what turned out to be an incredible battle between the legends of TORC off road racing. The return of off road racing under the lights in Southern California brought out the crowds to watch the best off road racing of the season on the tight half-mile race track. America’s favorite short course racer, Johnny Greaves, faced off against the nation’s toughest competition seen in years as the elite Pro4WD class battled fiercely under the bright lights of Perris Auto Speedway. Greaves charged his Monster Energy/ Toyota/ Potawatomi/ BFGoodrich sponsored race truck, while team Jeremy McGrath buckled up his Mastercraft Safety gear in his #2 Monster Energy/Toyota/Potawatomi/BFGoodrich two-wheel drive machine. Both Greaves and McGrath were the favorite among the legions of fans at the TORC Autograph sessions both nights. Jeremy McGrath battled not only the scorching elements of Mother Nature, but he also battled flu-like symptoms all weekend long. Greaves, on the other hand, was focused on the task of working on every angle of his race truck in order to be as fast as he could be on the track. One thing for sure, the Monster Energy/ Toyota/ Potawatomi/ BFGoodrich/ PIT & FAN ZONE was packed both nights as the Southern California fans flocked to the Greaves Motorsports pit to get an inside look at what makes Greaves and McGrath tick. The #22 Monster Energy/Toyota/Potawatomi/BFGoodrich Pro 4×4 had a solid practice run amid the incredibly hot weather conditions. By the time the lights came on and the temperatures fell, Greaves was more than ready to race. As the green flag dropped, the #22 Toyota Tundra catapulted towards the front of the pack early, demonstrating why Johnny Greaves has won 6-short course championships in his career. The crowd cheered loudly as the #22 Pro4WD railed sideways around each turn. Greaves drove the Toyota Tundra hard in multiple attempts to fend off Douglas as the two off road racing veterans rubbed doors in nearly every turn. Douglas and Greaves entertained the crowds with some of the most intense racing action seen this season, while some of the wildest drama of the season unfolded behind them. After a wild 20-laps of racing, Greaves earned his 8th top three finish of the season claiming the final spot on the podium. “The #22 worked great all night long. We have been working closely with BFGoodrich Tires and we had a great groove for the track tonight. Toyota TRD gave us a great motor package and we were right there up until we lost some track position in turn four after contact with Douglas. Things are bound to happen when we are racing on a tight course like here at Perris Speedway and we were on the wrong end of the ‘lucky stick’ tonight. But of course, there’s always tomorrow night,” said Greaves. Jeremy McGrath started the race from the pole position and charged his #2 Monster Energy/Toyota/Potawatomi/BFGoodrich backed Tundra race truck to an impressive hole shot taking the early lead. McGrath was all business as he raced fiercely and put his #2 Pro2WD in position for a podium position heading into the second half of the race. Poised for a final run in the last 10-laps of Friday night racing under the lights, McGrath bobbed and weaved through the carnage on the track while dicing it up with MacCachren and Johnson. McGrath dueled with Johnson right down to the final turn of the last lap where he finished on the podium in the third spot. “I felt real good all race long and then towards the end of the race, we had a slight mechanical failure with a brake rotor that slowed the #2 Monster Energy/Toyota/Potawatomi/BFGoodrich truck down. Racing under the lights on a Friday night in Southern California reminds of the old days and I’m stoked to be representing the Monster Energy/ Toyota/ Potawatomi/ BFGoodrich Johnny Greaves Motorsports team here in So Cal. We’ll be back here tomorrow night, ready to get it done,” commented McGrath. Mother Nature spared no mercy on the racing community Saturday. The California heat wave baked even the toughest off road racers on the planet as teams tried to stay cool. Temperatures soared into the triple-digits beneath the Monster Energy/Toyota/Potawatomi/BFGoodrich race awning, as the crew prepped the two Johnny Greaves Motorsports trucks for TORC Round 14 racing. By nightfall, as blistering temperatures gave way, a relaxed Johnny Greaves and Jeremy McGrath mingled with hundreds of fans on the track. An hour later, Greaves slid on his Monster Energy branded race helmet and took to the track in his #22 Toyota Tundra. As the fans rose to their feet for the start of the race, the #22 raced down the front stretch and took a high line up on the left hand steep banked turn one. 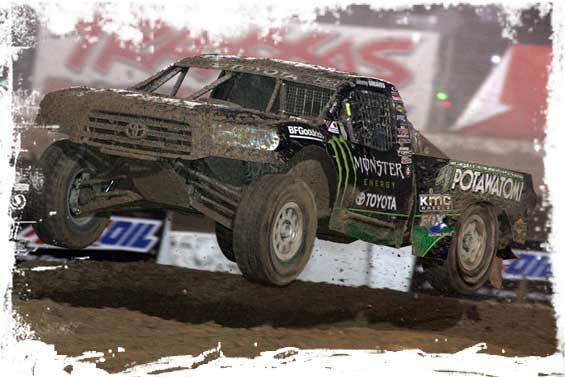 The truck was completely hooked up as the Toyota TRD motor revved high churning the 35″ BFGoodrich Tires on the dirt track allowing Greaves to pick any line he wanted for the exit of the first turn. Greaves hit the first of many jumps with his FOX Racing Shox tuned suspension at speed and railed on the outside of the backstretch. While Greaves once again became embattled in a race war with his archrival, Scott Douglas, the other Monster Energy backed Pro4WD began to slip away from Douglas and Greaves. After the first half of the race, both Douglas and Greaves, still in the midst of an epic race, had to then deal with charges from the #99 truck of Kyle LeDuc. As the race progressed towards lap 15 of the 20-lap main event, it was evident that Huseman was in a league of his own on Saturday night. Greaves continued mashing the pedal through each turn, but it wasn’t meant to be as the Wisconsin-native rallied early pushing to the ragged edge before finishing in the 4th position overall. The field of TORC Pro2WD race trucks rolled onto the track as everyone in the grandstands stood on there feet for the start of the race. Jeremy McGrath jumped to an early lead in front of MacCachren, Taylor, Vanden Heuvel and LeDuc. As the race progressed, McGrath and Todd LeDuc banged doors in nearly each turn as the Rockstar Pro2WD did everything he could to try to get around the faster Monster Energy #2 Pro2WD driven by McGrath. All the while, Vanden Heuvel stretched out a modest lead while MacCachren and point’s leader, Ricky Johnson swapped positions several times. After 10 laps around the Perris Auto Speedway, McGrath was in a great position for the final charge. As the race resumed to green flag racing the battle was on between McGrath, LeDuc, Johnson, MacCachren and VandenHeuvel. All five Pro2WD trucks came into turn 3 and only two came out unscathed. The chaos in turn three caught McGrath in the middle of it and he slid back several positions. With 6 laps to go, McGrath could do nothing but race for the series championship points. as the leaders were well out of reach. After 14 rounds of the 2009 TORC Series, Johnny Greaves has earned 261 total points in the PRO4WD class. Greaves is a mere two points behind the third place position and 45 points off the point’s leader, his Monster Energy teammate, Rick Huseman. Among the competitive PRO 2WD class, Jeremy McGrath has a 14 race combined total of 226 season points and climbed one position to the fourth spot. McGrath is 61 total points out of the top spot with two races to go. Tune into ESPN2 on Sunday, October 4 at 11:00pm EST (8:00pm Pacific) and watch all the race action from TORC Rounds 13-14. Check your local listings for broadcast times on ESPN2 in your region. Monster Energy/Toyota/Potawatomi/BFGoodrich sponsored Johnny Greaves Motorsports returns to racing action in the final TORC Series race weekend of the year on October 24-25, 2009 at the Las Vegas Motor Speedway. Please visit www.JohnnyGreaves.com for the latest news, photos and videos of all the action from the TORC Series at the Perris Auto Speedway. Crandon, WI (September 6, 2009)-Greaves Motorsports drivers, Johnny Greaves and Jeremy McGrath took to the dirt track at Crandon International Raceway with hopes of multiple victories for the high profile off road race team. Celebrating the 40th anniversary of the famed 1.65-mile track, the off road racing icons, Johnny and Jeremy demonstrated they were fast during Crandon’s Friday practice and qualifying sessions. The dynamic duo arrived to the nation’s most sacred off-road racetrack and were greeted by hordes of Monster Energy fans. Track officials reported over 50,000 fans in attendance on each of the two race days sandwiched in between the 4-day Labor Day holiday festival. Led by team owner, Johnny Greaves, the Greaves Motorsports race team was spit shined and polished for Friday’s Crandon Parade celebrating the 40th anniversary of Crandon International Raceway. Fans surrounded the two Monster Energy/Potawatomi/Toyota/BFGoodrich sponsored race trucks as Johnny and Jeremy signed autograph hero cards and posters throughout the event. The two off road racers were all business when it came to qualifying and the final practice before Saturday’s Crandon World Championship Race, which also doubled as round 11 of the 2009 TORC Traxxas Series. Johnny Greaves took to the track on Saturday with hopes to repeat as the Crandon World Champion, which he has accomplished on three other occasions in his career, but this year it was destined to be different. 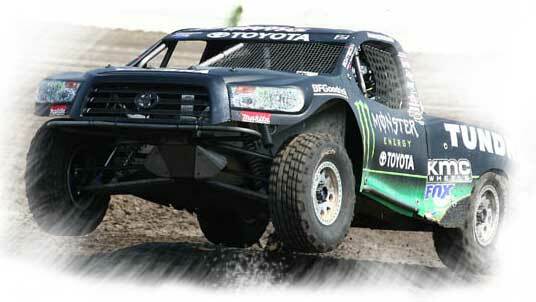 The #22 Monster Energy/Toyota/Potawatomi Pro 4×4 started from the land rush start and was up front early in the race. Greaves barreled into turn one at nearly 100 miles-per hour perched in a premier line. Johnny opened up the throttle on his Toyota Tundra shod with FOX Racing Shox and BFGoodrich Tires in front of the 50,000 fans all standing on their feet watching the epic race action. However, after only unfortunate fate struck early as Greaves made an inside pass on veteran racer, Curt LeDuc, who slid towards the outside and careened off the outside wall back into the #22 Pro 4X4 race truck at speed. Greaves suffered significant damage to the entire passenger side of the race truck including have both front and rear shocks ripped from the truck. Johnny’s day ended as he was forced to retire from the race pulling off to the inside of the race track ending the chance for the Wisconsin racing hero to captured another Crandon World Championship trophy. Jeremy McGrath was poised as he started Saturday’s World Championship Pro 2 WD race, but was cognizant of the importance of maintaining a top spot among the TORC Series point’s race which he is embattled in. McGrath rallied his race truck early and ran up front with the pack of leaders and made several charges towards the leaders throughout the race. However, after the mandatory mid-way competition yellow flag, McGrath was unable to move up in position and was force to settle for a 5th place overall position. “Crandon is a special place and racing today in front of this big crowd was pretty exciting, but it was not my day,” said the 7-time Supercross Champion. Sunday’s combined race took center stage as the Pro 4X4 teams prepared for the afternoon live television broadcast on ABC Sports. As the crew readied for the Borg-Warner televised race, Jeremy McGrath took to Crandon’s one-of-a-kind racetrack in mid-morning for the PRO 2WD race. The #2 Monster Energy/Potawatomi/Toyota/BFGoodrich backed race truck launched from the land rush start and was rocket fast, but before the first lap was over McGrath, aka “Showtime,” pulled off the track with a destroyed left front A-Arm that rendered the racing professional out of the race. Incidental contact with another truck created the carnage on the Greaves Motorsports PRO 2WD truck. At precisely 3:00 p.m. central standard time the combined ‘TORC Round 12 and Crandon Borg-Warner race kicked off on live television broadcasted on ABC Sports. Fourteen PRO 4WD race trucks raced down the straightaway from the famous Crandon land rush start and in the first two a harrowing crash involving six race trucks drew red flag and a restart for the world’s top off road racers. Johnny Greaves jumped to the front of the pack prior to the crash and was able to hold his near perfect line through Crandon’s turn one. “We had a great start for the Monster Energy/Potawatomi/BFGoodrich/Toyota backed Pro 4. It felt like I was on rails through the first turn and everything was good until I heard my crew chief, Curt, on the radio telling me it was a red flag with a restart,” mentioned the Wisconsin racer. The restart set in motion the #22 PRO 4X4 charging to the front of the pack. With the crowd of 50,000 fans on their feet cheering, Johnny Greaves made several incredible passes that he is well-known for. Once again, Greaves had to work hard to get around other veteran racers, but once he got by he set his sights on the leader, Kyle LeDuc. Most of the race, Johnny charged hard from the second position chasing down competitor, Kyle LeDuc. Lap after lap the #22 Monster Energy/Potawatomi/BFGoodrich/Toyota truck was closing in on the lead truck. “Our BFGoodrich Tires came to us at the right time and they were hooking up well on the Crandon dirt. Toyota TRD has been working very hard at perfecting the motor package and we had awesome power throughout the race. All that combined with our FOX Racing Shox package and we were making a move,” said Greaves. However, in lap six of the ten lap race, the unthinkable occurred when Greaves railed fast around the outside of the 180 degree hairpin turn near the land rush starting area, but suffered a miscue resulting in a roll over. Johnny’s run for the 2009 Crandon Borg-Warner Championship had ended. After 12 rounds of the 2009 TORC Series, Johnny Greaves has earned 223 total points in his quest for the 2009 TRAXXAS TORC Series Season Championship. Johnny is 21 points behind Kyle LeDuc at 244 points and fellow Monster Energy/Toyota sponsored racer, Rick Huseman, leads with 265 points. Among the competitive PRO 2WD class, Jeremy McGrath has a total of 189 season points and is in fifth position behind leader, Ricky Johnson who has a racked up 244 points. Monster Energy/Toyota/Potawatomi/Toyota/BFGoodrich sponsored Johnny Greaves Motorsports returns to racing action in the 2009 TRAXXAS TORC Series on September 25-26, 2009 for Rounds 13 and 14 at Perris Speedway in Perris, California. Bark River, MI (August 10, 2009)-Over 17,000 thousand fans packed into the Bark River International Raceway near the shores of Lake Michigan for Rounds 9-10 of the TRAXXAS TORC Off Road Race Series. Bark River International Raceway is located 10 miles Southwest of Escanaba, Michigan. The 1.5-mile race course features undulating terrain and boasts the highest elevation change of any race course in the 2009 TORC Series. The Monster Energy/Toyota/Potawatomi/BFGoodrich sponsored duo of Johnny Greaves and Jeremy McGrath arrived to the track with one goal in mind and that was to continue charging for the series championship in both the Pro4WD and Pro2WD divisions. Combined, the Greaves-McGrath race team has garnered 10 podium finishes so far this season, with six races left to determine the series championship. Both racers are positioned to rally for the series championship trophies. Early Friday, the two off road champions spent serious time on the track evaluating the recent changes made to the 1.5-mile racetrack prior to the afternoon practice where the two drivers proved that both Monster Energy/Toyota/Potawatomi/BFGoodrich race trucks were dialed in and very fast. Fans lined up in front of the Monster Energy/Toyota/Potawatomi/BFGoodrich PIT ZONE in search of posters and autographs from both drivers who stayed until the last fan received special attention. That was about the time that Greaves and McGrath suited up for Saturday’s racing extravaganza. Throughout the day, TORC race officials tracked moving masses of unstable weather threatening the region, but once the Pro 2WD’s took to the track, everyone in the stadium focused on the door-to-door truck racing action. The wild and exciting battles surprised no one, as the field charged the first turn all following the #2 Monster Energy/Toyota/Potawatomi/BFGoodrich Pro2WD driven by Jeremy McGrath. Lap after lap, McGrath’s BFGoodrich Tires churned up tight lines that were powered by the awesome Toyota TRD power plant, allowing him to run wild in the front of the pack. McGrath led the majority of the race, but with only a few laps to go, McGrath was hampered by a fogging face shield. 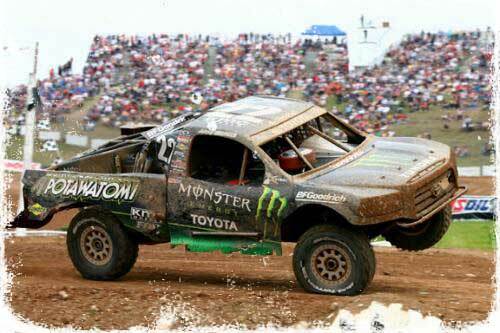 “The #2 Monster Energy/Toyota/Potawatomi/BFGoodrich Pro2WD was excellent today. The team gave me a great truck and I felt that we ran solid, but my helmet shield was fogging up really bad and I just couldn’t see during the last couple laps of the race. I held off Ricky as long as I could, but I ended up having to deal with the inability to see forward and a couple trucks got by me,” said the upbeat McGrath. The #2 Monster Energy/Toyota/Potawatomi/BFGoodrich Pro2WD racer finished the race in third place on the podium and set the fastest lap time of the race, earning the exclusive OAKLEY Bomb Award for the first time this season. Greaves rolled onto the racetrack in his #22 Monster Energy/ Toyota/ Potawatomi/ BFGoodrich Pro4WD starting from the third row after the mandatory inversion. As the green flag dropped, Greaves worked his magic on the track and by the time the mandatory yellow caution flag waived at the halfway point, Greaves was in second place. As the race restarted, fan favorite Johnny Greaves, charged on the lead truck when the unthinkable occurred and he suffered a mechanical failure that sidelined him in the final laps of the race. Greaves ended up the day in 7th position overall. Sunday was another day and another race as Mother Nature cooperated with the weather and track conditions were spectacular. There was an intense buzz among the thousands of fans that came out for another wild day of off-road racing and they lined up in front of the Monster Energy/Toyota/Potawatomi/BFGoodrich PIT ZONE. As race time approached, Jeremy “SHOWTIME” McGrath strapped himself into his MasterCraft race seat and prepared for yet another battle of the nation’s top off road warriors. As the Pro2WD race kicked into high gear, so did McGrath, as he waged war while starting from the second row. 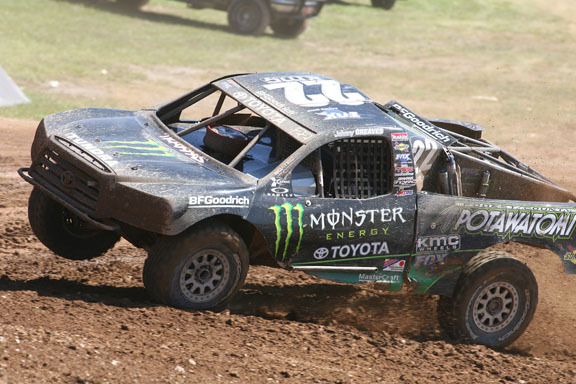 The #2 Monster Energy/Toyota/Potawatomi/BFGoodrich Pro2WD was making strides and running in the top three when he was forced to brake hard to avoid massive carnage in the final turn before the start-finish line. McGrath was shuffled to the back of the pack, but that didn’t dissuade the 7-time Supercross Champion from rebounding and focusing on the task at hand. In short order, he climbed back to a top five position when he was bombarded with some massive sized rocks and chunks of dirt that broke loose the windshield rock guard from its mounted position in front of the steering wheel. “All systems were go and the #2 Monster Energy/ Toyota/ Potawatomi/ BFGoodrich Pro2WD was working perfectly. Then all of a sudden I was bombed by the roosts from two trucks that broke off the front window rock guard and left it wrapped around the steering wheel of the truck. I was left with this metal rock guard tangled around the steering wheel. By the time I got the rock guard untangled, I was in the back of the pack. The truck was good all weekend long, we had a couple unfortunate circumstances that didn’t go our way this weekend. We’re racing in the front with the leaders at every race and we are close, very close. We are headed to the 40th Anniversary at Crandon International Raceway with the #2 Monster Energy/Toyota/Potawatomi/BFGoodrich Pro2WD and I’m feeling confident that we’ll be right there in the front vying for the top spot in Rounds 11-12. In Sunday’s Round 10, Johnny Greaves lined up side-by-side with the #7 Amsoil Pro4WD of Scott Douglas in the second row. It didn’t take long for Greaves to assess the situation of the top two race trucks as they used each other as moving bumpers while racing down the track. After two laps and the field of Pro4WD trucks opened up some space, Greaves dueled with the likes of Kyle LeDuc, Rick Huseman and Steve Barlow. However, after the mandatory yellow caution flag, Greaves mashed the right foot pedal of the #22 Monster Energy/Toyota/Potawatomi/ BFGoodrich Pro 4WD in search of victory. Johnny flew around Steve Barlow before setting his sights on his Monster Energy teammate, Rick Huseman. Fans cheered on the #22 black and green race truck and gasped when Greaves put the truck onto two wheels for a short moment. However, in true Greaves fashion, the slight deviation didn’t stop him from attacking the track and forging to the front of the pack. And although he didn’t win, when the checkered flag dropped, Greaves earned his sixth podium thus far in the 2009 TRAXXAS TORC Series. 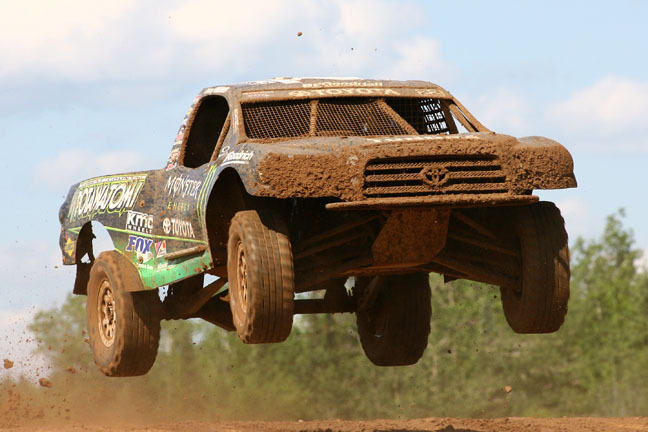 After 10 rounds of the 2009 TORC Series, Jeremy McGrath maintains a top five position in the Pro2WD overall championship point’s race with a total of 171 points, while teammate Johnny Greaves sits in third place overall with a 199 points in the Pro4WD class. Monster Energy/Toyota/Potawatomi/BFGoodrich sponsored Johnny Greaves Motorsports returns to racing action in the 2009 TRAXXAS TORC Series on September 5-6, 2009 for Rounds 11-12 in Crandon International Raceway in Crandon, Wisconsin. Crandon International Raceway is celebrating its 40th Anniversary of off road racing over the weeklong festival beginning on August 31 through September 6, 2009. Visit www.crandonoffroad.com for all the details. The 2009 TRAXXAS TORC Series Rounds 9-10 will be broadcasted on ESPN2 on Sunday, August 16, 2009 at 11:30 a.m. for a 90-minute television special. Check your local listings for broadcast times near you and visit www.torcseries.com for additional information. Bark River, MI (July 13, 2009)-Johnny Greaves, the 6-time off road racing champion, was all smiles Sunday afternoon as he completed a weekend sweep of the 2009 TRAXXAS TORC Series Rounds 7 and 8. Dominating performances this weekend add important series points in his quest to reign as the TORC series champion. Bark River International Raceway welcomed the Traxxas TORC Truck Series to Michigan’s Upper Peninsula amid the 70-degree weather while some 6,000 fans packed the grandstands on both Saturday and Sunday. Bark River International Raceway is located ten miles Southwest of Escanaba, Michigan along the shores of the beautiful Lake Michigan. The 1.5-mile race course features undulating terrain and boasts the highest elevation change of any race course in the 2009 TORC Series. 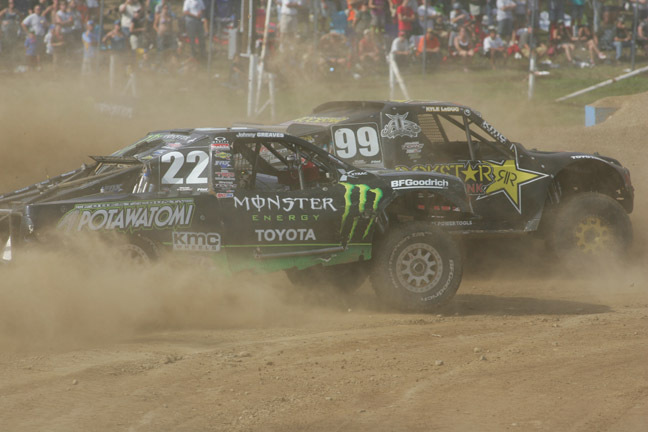 The #22 Monster Energy/Toyota/Potawatomi Pro 4X4 was the class of the field on both race days. On Saturday’s Round 7 race, Greaves started in the second row and after just three laps behind the pole sitter, the Wisconsin native jetted to the front of the pack and never looked back. When the yellow midway caution lap came out, the field of Pro 4X4’s closed the gap on the Monster Energy off road racing superstar. However, as the field returned to green flag racing, the #22 charged out to a comfortable lead. Thousands of fans cheered as Johnny carved his line from the soft Michigan dirt enroute to yet another remarkable victory. Johnny Greaves set the fastest practice time around the 1.5 mile race course in Saturday’s early morning practice and captured his first of two Oakley Bomb Awards that he earned in rounds 7 and 8. Sunday’s Round 8 race action saw the #22 Pro 4WD begin his charge for victory from the second row side-by-side with the Amsoil #7 truck. As the green flag dropped, the Wisconsin native wicked up the pace early and by the second lap, he had weaved through the field of Pro4X4’s to take the lead. Greaves pushed his #22 Monster Energy/Toyota/Potawatomi truck just to the edge as he opened up a two second lead on the 2nd place truck. Johnny’s dazzling driving performance was exactly what the thousands of excited fans had come to the Bark River Raceway for. At the mandatory midway yellow caution flag, the chasing field of race trucks all bunched up behind the wicked fast Toyota-powered machine. The green flag dropped and Greaves railed around the 180-degree turn, holding off all racers and immediately jumping out to the front of the field. After one lap, Greaves had already established a one second lead, while running away from the field enroute to a dominating victory at Bark River Raceway. On the podium, the smiling winner held up an ice cold can of Monster Energy Drink high into the sky celebrating a weekend sweep. Greaves winning ways has catapulted him into the second position in the race for the season championship. This past weekend of racing marks the halfway point of the season and with eight races to go the twenty points that separate the point’s leader and Johnny Greaves is well within reach. What has proved to be a test of horsepower, driver skill and nerves of steel, 7-time Supercross Champion, Jeremy McGrath, arrived to his #2 Monster Energy Pro2WD primed and ready to rock Michigan’s Bark River Raceway. This would be McGrath’s first visit to Michigan’s Upper Peninsula gem of a track, although he demonstrated early on that Bark River Raceway was much to his liking. The Southern California native, who has often been referred to as “MC”, “Showtime” or “The King” meaning, the King of Supercross, was all business as he climbed from the #2 Monster Energy/Toyota/Potawatomi sponsored truck after practice. McGrath’s racing teammate, Johnny Greaves, has raced at Bark River Raceway for many years and he and Jeremy made their way around the track several times together. This year the Bark River Raceway racecourse was slightly enhanced by track designers. With thousands of fans packed into a beautiful amphitheater style area, McGrath started Saturday’s Round 7 of the 2009 TORC series on the front row. McGrath blasted off the start line and got through the 180 degree starting turn unscathed before a battle brewed between him and the chasers, but it was short lived, as the #2 Monster Energy Pro 2 suffered a broken ignition wire after only one lap, which sidelined the 38-year old racing icon. McGrath had demonstrated over the past two days that he was very fast in the Monster Energy/Toyota/Potawatomi Pro 2WD with a fast practice time of 1:24:099. He was a mere couple hundredths off Rob MacCachren. Sunday’s Round 8 was indeed another day for the California racing professional. Once again, Jeremy started on the front row with Dan Vandenhuevel and in the first turn, they were locked in a battle for the top spot. McGrath slid his #2 Toyota powered truck into the second turn and when they emerged from the dust and flying fiberglass he was side-by-side with two other competitors. McGrath rallied through the big bumps and ran a strategic race to the mandatory midway yellow caution flag. As the green flag dropped, McGrath nosed his Pro 2WD into the turn and flat footed the pedal, churning up the Michigan dirt while his BFGoodrich Tires hooked up and provided excellent traction. With four laps to go, McGrath railed a left hand turn on the inside of Todd LeDuc who went wide, allowing McGrath’s Toyota power to launch him into lead. Jeremy flew high over the top of the massive jump as he continued to lead. McGrath was forced to battle door-to-door and bumper-to-bumper with MacCachren for the final three laps. McGrath held off the short course racing veteran in what many have described as the best Pro2WD race action of the season. McGrath and MacCachren battled in close quarters all the way down to the final turn where Jeremy McGrath finished just off the bumper of MacCachren. After 8 rounds of the 2009 TORC Series, Jeremy McGrath maintains a top five position in the overall championship point’s race with a total of 133 points. Monster Energy/Toyota/Potawatomi sponsored Johnny Greaves Motorsports returns to racing action in the 2009 TRAXXAS TORC Series on August 8-9 for Rounds 9 & 10 in Bark River, Michigan. The 2009 TRAXXAS TORC Series Rounds 7 & 8 will be broadcasted on ESPN2 on Sunday, July 19, 2009 at 11:30 a.m. Check your local listings for broadcast times near you and visit www.torcseries.com for additional information. Crandon, WI (June 23, 2009)-The Monster Energy Toyota team of Johnny Greaves and Jeremy McGrath rolled into the famous Crandon International Raceway to greet over 24,000 fans for the traditional “Brush Run” hosted by Forest County Potawatomi. While Greaves and McGrath struggled with some mechanical failures and race contact damage, both Jeremy McGrath and Johnny Greaves left on Sunday feeling as if they may have figured out some things about their set-up that will propel them back to the top for the rest of the year. Greaves salvaged a 4th place finish in round 5 on Saturday while McGrath had a cut tire as he was positioned for a win but was still able to pull-off a 4th place finish and tied for 3rd in the points. Round 6 was even tougher for both-Greaves broke had a ring and pinion and McGrath had engine failure. In Saturday’s round 5, Greaves got off to a 5th place start and quickly started his move to the top in lap one. He quickly moved into 4th and was charging hard to the front when he had a front-end failure and was loosing traction. He held on to finish 4th and gain valuable points for the title chase. On Sunday in Round 6, Greaves again battled hard through the start and looked as if he had the speed to win, when he had a ring and pinion failure that put him out of contention for the win. Jeremy McGrath had a solid weekend of racing, but again was denied the podium due to mechanical failure that plagued the Monster Energy team all weekend. In round 5 on Saturday, McGrath drove a solid race and was battling for the lead with Scott Taylor when he developed a flat rear tire from heavy contact with Vanden Heuvel on the back turn. His tire was cut deep and flat but McGrath held on for an impressive 4th place and tied for 3rd in the points. On Sunday, in round 6, McGrath was again charging hard for the lead when he blew the engine on lap 5 and had to watch from the in-field. He only dropped a couple of positions to 5th in the points. In the Forest County Potawatomi Chairman’s Cup race, Greaves made some significant changes to the set-up and came out charging early on in lap one. After a 5th place start, Greaves had already passed the Pro 4X4’s and was making his move to the Pro 2’s by the gravel-pit turn. Greaves was once again disappointed as he lost steering from a broken steering belt, forcing him to pullout. Perris, CA (May 31, 2009)-The Monster Potawatomi Toyota team of Johnny Greaves and Jeremy McGrath left Perris Auto Speedway Sunday morning with big smiles on their faces as Greaves earned his first win in the new Traxxas TORC Series on Friday night while McGrath earned another second place spot on the podium in round 4. On the weekend the team racked-up three podiums finishes in front of a big crowd in Southern California and the pair of Monster Toyota’s were a fixture in all the race battles for the lead. On Friday night, McGrath jumped out to an early lead in the Monster Hammerhead Toyota Pro 2WD class and lead the race all the way to the halfway point. Late in the race the supercross legend got caught-up in some fender banging and ended up in 8th. On Saturday night, McGrath once again got off to a Monster of a start by leading all the way until the competition caution with fellow Supercross champion Rick Johnson in second. On the re-start, Johnson made an aggressive move to get around McGrath and the battle was on. Exciting the TORC fans, McGrath and Johnson fought hard for the rest of the race with McGrath taking the second place podium spot for Toyota and giving the “Showtime” fans a great show. Longtime crowd favorite Johnny Greaves started his weekend off in the right direction Friday night with a win and tough battle with veterans Scott Douglass and Rick Huseman. Greaves made it look easy, putting his Tundra out front early on and leading the race the entire way. Huseman and Douglas fought hard and challenged the veteran Greaves late in the race but was unable to overtake the BF Goodrich shod Greaves and Johnny was back on the familiar ground of the top of the podium for TORC round 2. On Saturday night, Greaves once again got out to an early lead on lap one holding this position all the way till lap 17 of the 20-lap race when a hard charging Toyota of Rick Huseman was able to slide underneath Greaves for the win. The crowd was entertained as usual with close racing the entire way. Scott Douglas worked hard to try and overtake Greaves in lap 18, but was unable to overtake the crafty Greaves and Johnny went on to finish second. Ft. Worth, TX (May 16, 2009)-The Monster Energy Potawatomi Toyota Team of Johnny Greaves and Jeremy McGrath excited the Texas fans this weekend in Rounds 1 and 2 of the new Traxxas TORC Truck Series by putting on a show filled with vintage Greaves’ fast laps and exciting crashes. McGrath added to the teams allure by showing that he is going to be right in the middle of the Pro 2WD championship hunt in 2009, as he looked extremely quick in the new Toyota. McGrath took to the stage first Friday night with a strong start and got into the hunt for the lead early, battling with Pro 2WD veterans, Rob McCachren and Ricky Johnson. After battling hard McGrath slid wide and let Johnson take the lead late in the race giving McGrath a second place finish on the podium and got the new TORC Season off to a great start for the supercross legend. “The fans got a real charge out of seeing RJ and me going at it and I can’t wait to get even in Perris,” stated McGrath. Next up was 6-time Champion and team owner Johnny Greaves in the Pro 4X4 class where Greaves jumped out to a huge lead on lap 1. Greaves led by a wide margin with teammate Rick Huseman and Scott Douglas following behind by the time the competition yellow flag dropped at the midway point. After the yellow, Greaves increased his lead once again until he started having some front drive issues causing an unexpected spinout, allowing Huseman’s Toyota to gain the lead with Kyle LeDuc in second. Greaves fought past the younger LaDuc and into second and went after Huesman, but once again the front-drive issue prevented him from catching Huseman. Greaves settled for a hard-fought third to round out the podium.